Rockabilly weddings combine rock n roll music and retro styling for an off-beat and unconventional theme that couples are embracing with more regularity. Rockabilly was 1950’s rock n roll music blending western and country with rhythm and blues. It was associated with retro fashion, pop art and classic cars and was a form of rebellion. We love nostalgia and things of days gone by. I guess in the distant future we will be having rap weddings! Retro and vintage 1950’s fashion for her can be found online and the groom has it easy really by just donning a tight t-shirt, a leather jacket and shades. Don't forget to grease your hair! Vinyl records, polka dots and checks are obviously going to set the scene. Vintage and retro posters can adorn the walls. A jukebox would obviously be very desirable if you can manage to hire one. Guitars and other rock instruments would fit the bill or even just ornaments of them. You're bound to have a lot of fun and this spread will hardly break the bank! You might want to consider some rockabilly games seeing as how you are being so rebellious anyway! Hula hoops or retro karaoke perhaps? The best Elvis wins a chocolate sundae! A kissing booth or hopscotch would be cool. Enjoy coming up with ideas! On a warm summers day there is nothing better than strawberries and cream, a picnic blanket and polkadot parasols! Why not make this the theme for your Bridal Shower. 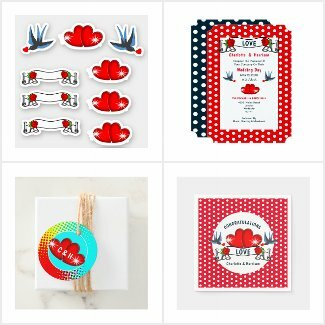 If you're a fan of 1950s fashion and music, are planning a retro vintage rockabilly styled wedding, then a tea party bridal shower (or for your wedding luncheon) is a great way to relax after a busy morning and gather your energy for an evening of rock'n'roll dancing whether it be at your wedding reception or your bachelorette party! 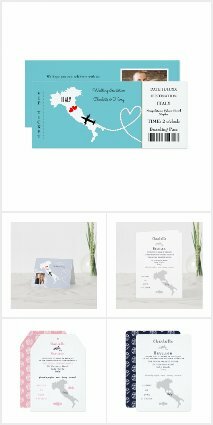 These invitations have text template fields so you can edit them accordingly to suit your exact needs. For matching items, or custom edits just drop me a line and I will see what I can do! 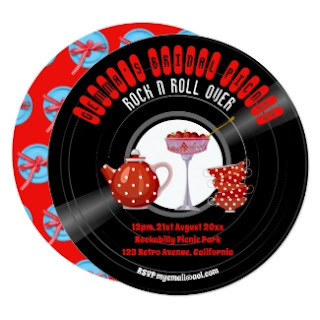 Set the theme for your rockabilly tea party with vintage 1950s style red and white polkadot tea pot, cups and saucers, a retro blue picnic or table cloth, dainty matching napkins and cake trays decorated with red cherries, strawberries and cupcakes. Have some sparkling wine or Champers on hand to toast after you've enjoyed your bridal / wedding brunch. "This vintage style bridal shower features two Pin Up Girls talking on the phone in their lingerie. A perfect invitation for the gal who loves all of the Fabulous fashions of the vintage eras. This invitation will set the theme for the bridal shower! Ask your guests to wear Vintage Clothes and hire a Pin Up Photographer! Check it out... some versions with tattoos! This vintage style bridal shower template features two Pin Up Girls with tattoos talking on the phone in their lingerie. A perfect invitation for the gal who loves all of the Fabulous fashions of the 1920's -1960's eras. In charming pink with polka dots this invitation will set the theme for the bridal shower! Ask your guests to wear Vintage Clothes and hire a Pin Up Photographer! Customize this invite with your own information. 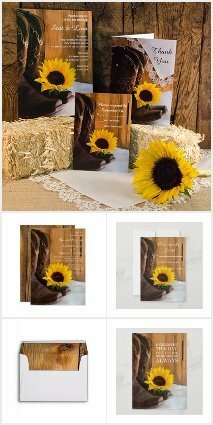 This card is customizable, available on multiple card stocks and is custom printed." The Designer says: "For the retro bride - She's got a great sense of humor and loves all of the Fabulous fashions of the 1940's - 1960's eras. This is the perfect Bridal Shower Invitation for a brunch or party that is especially girly. 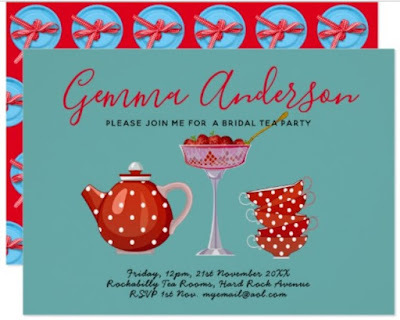 A cute and funny vintage bride invites your guests to a one of a kind, super fun event. You can even request the guests wear vintage clothes! Fully customizable!" 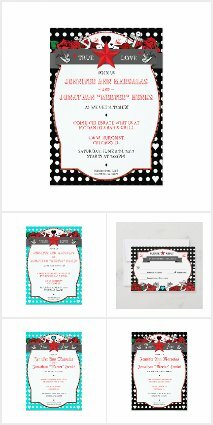 Retro Rockabilly Alternative Wedding Inspired by retro 1950's fun Rockabilly style dresses and comic book graphics; a design ideal for couples looking for something a bit different. 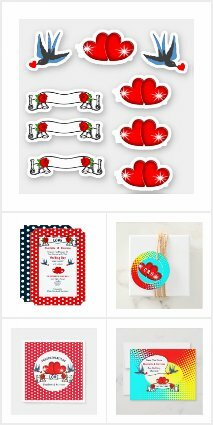 Luscious red hearts, tattoo style swallows, red and white polkadots make this a wonderful collection for your Rockabilly wedding, bridal shower and reception. The Designer says: "A fun 1950s, 1960s style retro housewife gossip bridal shower invite. This is the perfect bridal shower invitation for a unique wedding shower. A group of cute and funny vintage girlfriends invite your guests to a one of a kind event. Request the guests wear vintage clothes! Fully customizable! You can even change the words in the voice bubbles. 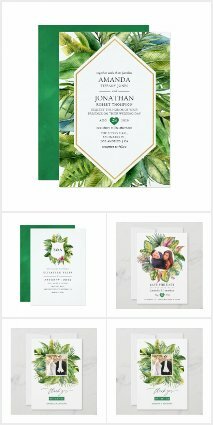 This invite is available on multiple card stocks and is custom printed." Look at this fun 1950s, 1960's style retro housewife gossip bridal shower invite. This is the perfect bridal shower invitation for a really unique wedding shower. A group of cute and funny vintage girlfriends invite your guests to a one of a kind event. Fully customizable! You can even change the words in the voice bubbles. This invite is available on multiple card stocks and is custom printed. You can edit this invitation for ANY couples event, just add your own photo and edit the event details as required! Fun red and white polkadot with black for a Rockabilly wedding event.